Rewriting is a branch of computer science whose origins go back to the origins of computer science itself (with Thue, Church, Post, and many other prominent researchers). It has strong links with mathematics, algebra, and logic, and it is the basis of well-known programming paradigms like functional and equational programming, which are taught at the universitary level in many countries. In these programming paradigms and corresponding languages, the notions of reduction, pattern matching, confluence, termination, strategy, etc., are essential. Rewriting provides a solid framework for understanding, using, and teaching all these notions. Rewriting techniques are also used in many other areas of software engineering (scripting, prototyping, automated transformation of legacy systems, refactoring, web services, etc.) and are implemented in popular systems like Mathematica, Autocad, and others. Rewriting techniques play a relevant role in computing research, education, and industry. 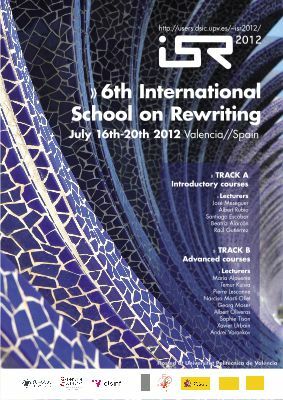 The International School on Rewriting is promoted by the IFIP Working Group 1.6 Term Rewriting. The school is aimed at master and PhD students, researchers, and practitioners interested in the study of rewriting concepts and their applications. Track A: for newcomers in the field, or just for people who want to obtain a new, updated exposure. Track B: for those who want to get deeper in the most recent developments and applications of rewriting. July 3-8, 2010 (Utrecht, The Netherlands). June 22-26, 2009 (Brasilia, Brazil). July 21-26, 2008 (Obergurgl, Austria). July 2-6, 2007 (Nancy, France). July 3-7, 2006 (Nancy, France).